Most people know when they’ve not had enough sleep after a night on the town or extra hours at work, but what they may not realise is that they are probably not getting adequate rest most of the time. If you often find yourself drowsy at the most inopportune times or going through the day with odd aches and pains, you are probably one of the millions who simply isn’t getting the amount or level of sleep required for health of mind and body. However, don’t worry. There are ways to ensure you get a perfect night’s sleep. According to the Mayo Clinic, sticking to a sleep schedule of no more than 8 hours daily is of vital importance. It’s all about biorhythms and how your body works best when sleep patterns are structured. The sleep/wake cycle should be the same on weekends as it is on weekdays and you should try never to vary the schedule you’ve set out for yourself. Of course, there will be the occasional shop party or entertaining of out-of-town guests, but limit the number and frequency of days you disturb your sleep schedule. 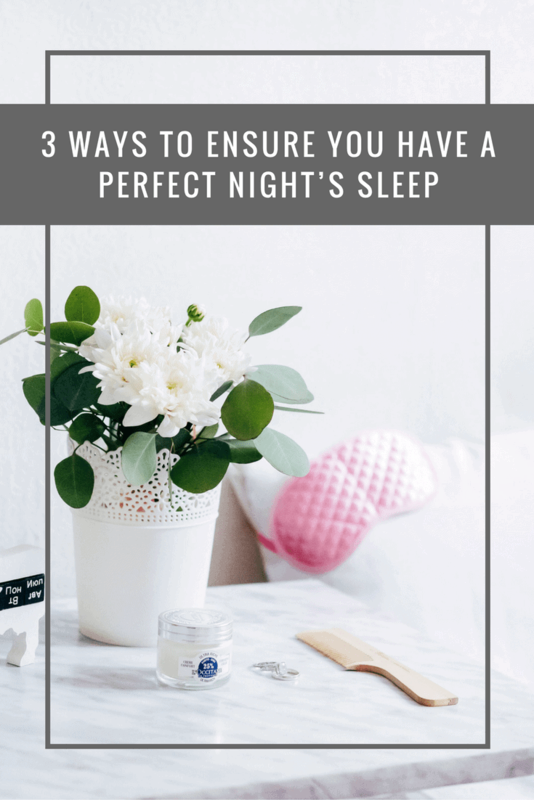 This is only the first step to ensuring you have a perfect night’s sleep. While many people who suffer those odd aches and pains throughout the day know that the ultimate cause is the mattress on their beds, there are even more who are totally unaware of the importance of comfort and support while sleeping. You may be suffering lower back pains, neck pains, headaches and any number of ailments throughout the day which can be directly related to sleeping on the wrong mattress for your needs. To find a mattress that meets your requirements, try taking a look at the range offered by companies such as The Place for Homes, as they also offer accessories like specifically designed pillows for extra support. Avoid nicotine as well as caffeine within an hour or two of bedtime. Never eat a huge meal or snack within a few hours of going to bed. Avoid strenuous activity or being overly excited prior to turning in. Alcohol will also, believe it or not, disrupt your sleep patterns. As the old saying goes, you get out what you put in, so mind what you eat and drink prior to bedtime and you will get out a good night’s rest. You need your sleep, so with a few common-sense tips, that’s just what you’ll get. It is, after all, just what the doctor ordered. Fantastic advice – we stayed in a hotel last week and I swear their mattress was the most comfortable thing I’ve ever slept on. It’s made me want to refurbish my bedroom!